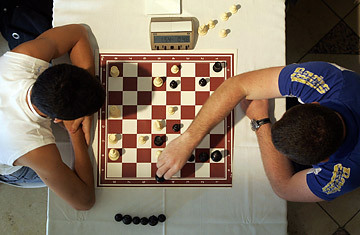 Chess players compete during the semifinals of the World Blitz Chess Championship in the Israeli city of Rishon Letzion. What makes an Olympic sport? The games that get the official nod from the International Olympic Committee (IOC) can be controversial and sometimes bewildering: rhythmic gymnastics is considered a competitive Olympic sport, but ballroom dancing is not. Handball and badminton are part of the program, yet rugby and squash don't make the cut. Among the 28 sanctioned sports for 2012, you can find table tennis but not golf, baseball, softball or racquetball. Curling is also on the official Olympic roster, and that really piques Kirsan Ilyumzhinov, president of the World Chess Federation (FIDE). Curling is simply "chess on ice, and it is an Olympic sport," he says, "but classical chess is not!" Ilyumzhinov has been struggling for over a decade to get the board game of chess, a "sport of the mind," accepted by the IOC. The World Bridge Federation (WBF)  representing the card game of bridge  is similarly disgruntled. Like the chess federation, the WBF has been lobbying since 1995 to claim a piece of the Olympic spotlight. In their efforts, both organizations have even offered to submit players to drug testing in order to conform to the Olympics' anti-doping code standards. Once again, however, both bridge and chess were denied entry last year. Neither FIDE nor WBF is taking the rejection lightly. Gaining recognition as an official Olympic sport could greatly benefit the games, raising their profiles in countries where they don't get much government funding. At one point, FIDE considered suing the IOC in the Court of Arbitration for Sport, which handles international sport disputes in Lausanne, Switzerland, but later relented. Peter Rajcsanyi, public-relations director of FIDE, admits that "our strength is not in the court" and that FIDE is now in "the process of serious negotiations [with the IOC] and improving relations." To that end, the chess organization has opened an office in Lausanne with the aim of getting closer to IOC officials, as well as promoting chess as an international sport, Rajcsanyi says. Adding official sports to the Games is a tricky matter, in part because of the bloated size of the event. IOC spokeswoman Emmanuelle Moreau says the Olympic Games are already so big that many cities can't accommodate them. So when IOC president Jacques Rogge took office in 2001, he capped the number of sports at 35 (28 in summer, seven in winter) and implemented a regular review process to avoid further expanding the Olympic program. The IOC now votes on new sports and reviews existing ones, based on thorough technical analyses and specific criteria, after each Olympics. (The Beijing Games will be the last to include baseball and softball; the IOC has cut them for 2012.) The IOC granted the bridge and chess organizations Recognized International Sports Federations status in 1995 and 1999 respectively, but says it hasn't accepted either game into the official register because they both lack the essential feature of physical activity. "Mind sports, by their nature, cannot be part of the program," says Moreau, though she says the IOC hasn't rejected their bids entirely. "In the ancient Olympic Games, the element of cultural and mental activity was present," Rajcsanyi counters. Indeed, the ancient Olympic Games included contests in music, theater, poetry and other arts. "In the Olympic Games, until the Second World War, there were competitions that rewarded the mental efforts of people in the same manner they rewarded physical efforts," he adds. "Today, the missing element of the intellectual competition can be reintroduced by the involvement of chess, and perhaps bridge." Bridge enthusiasts would further disagree with the characterization of the card game as a nonphysical activity. Dan Morse, secretary of WBF and president of the American Contract Bridge League, says, "We think bridge is a sport. It requires stamina, brain power and concentration ... Bridge is a sport just like baseball and football. It requires training and strenuous exercise. It is more than just a game." The national Olympic committees of some countries have already accepted bridge as an official sport. Before the 2002 Salt Lake City Olympics, WBF held an exhibition competition, and the chess federation held two similar matches at the Sydney Games in 2000. For now, both FIDE and WBF will continue their global crusades for Olympic acceptance. This fall, bridge and chess players will compete in the first-ever World Mind Sports Games in a venue familiar to international sports lovers  Beijing. More than 3,000 competitors from at least 150 nations will vie for 35 gold medals in chess, bridge, draughts (checkers), Go and xiang qi (a Chinese version of chess). The event will take place at the National Convention Centre, in the heart of the Beijing Olympics site. The Mind Games, Rajcsanyi says, will "show to the world that these games require effort, competence and determination just like any other sport" and "can bring joy, happiness and spectacle to the participants and to the audience." Georgios Makropoulos, deputy president of FIDE and the International Mind Sports Association, agrees: "We hope that this event in Beijing will be so important and so big that the IOC will understand that they need us."